Wild grey squirrels are not thought to be very social animals. The most frequent squirrel interactions that the casual observer will see is agonistic behaviour: in other words chasing each other off and fighting. But if you observe squirrels for long enough you’ll begin to notice some social ties. For example here we have a picture of Lucy lazing around on a hot summer day and cuddling next to her baby Inky. Of course as soon as food is involved all bets are off and Lucy will be just as vicious in chasing her own baby away as she would be with any other squirrel. But outside of that situation, the two seem to maintain an attachment and to enjoy spending time together. We have even noticed them grooming each other from time to time, though regrettably we don’t have a picture of that yet. We have also noted that siblings or even nest-mates sometimes remain on friendly terms as well in this article about two squirrels playing. Last year we had a squirrel that suffered from severe brain injury, probably caused by raccoon roundworm, that we called ‘Wobbly Squirrel.’ As a result of his brain injury he had severe balance problems, and drooled constantly. The brain injury also made him a particularly grouchy squirrel. He wouldn’t tolerate any other squirrel near him when he was feeding. 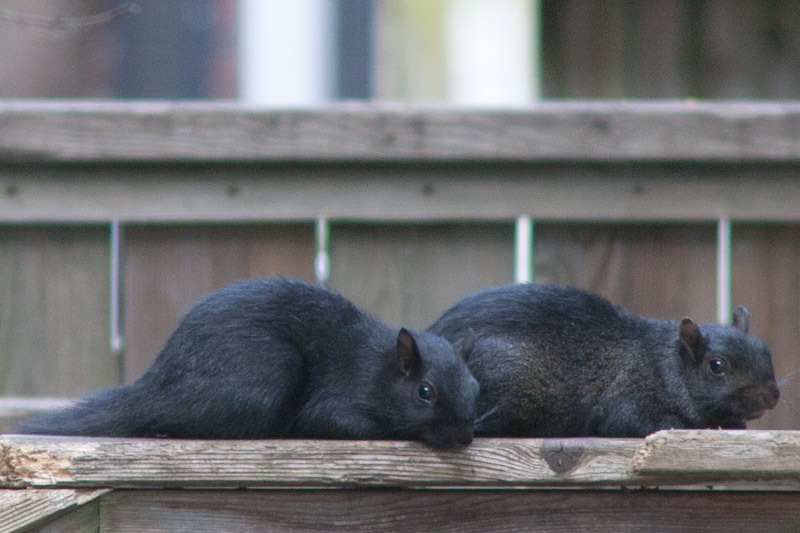 Because of this we were really surprised, one time last fall, to see Wobbly and another male squirrel playing and roughhousing on the fence presumably passing the time while waiting for food. This entry was posted in Inky, Lucy. Bookmark the permalink.